Celebrity Xperience - the newest ship in the Celebrity fleet is in a class by herself, designed not just for travel, but for exploration of the Galapagos Islands, one of the world's last pristine environments. 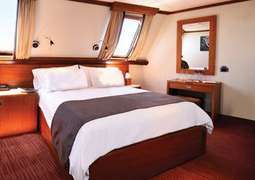 Celebrity Xperience offers amenities in an intimate atmosphere of 24 oceanview cabins and 4 decks. All the cabins come with large windows and a sitting area where you can kick back and relax after a day that has been as busy or easy as you want. The main Dining Room serves a full buffet breakfast with made-to-order eggs and omelets and lunch along with an a la carte/buffet combination for dinner. You can opt to enjoy an Early Riser continental breakfast or lunch under the open air shade canopy at the Al Fresco. The latter is also the place to go for specialty drinks and music. On special nights, enjoy Dinner Under the Stars. The main entertainment on the Celebrity Xperience are the itineraries with exciting combinations of pre- and post-cruise land experiences. All the gear you'll need, such as snorkeling equipment, wetsuits and binoculars is included to help you fully experience the world's most amazing archipelago. Daily briefings will take place at the Lounge Bar. If it gets too much, enjoy some peace and quiet at the Library on the Boat Deck or a spot of R&R in the Sun Deck hot tub.